The cam & Groove coupling, also known as the cam lock coupling, is a time tested convenient hose coupling found in numerous applications across many industries. The coupling system is simple enough, pull down the levers on the coupler, and the adapter is drawn into its seal. 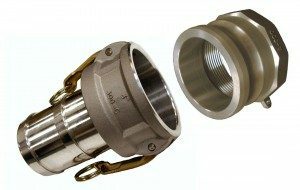 There are threaded couplings, hose barbs, caps and plugs, plus different options in metal types. That should cover it, right? Well not quite… Over decades of development and competition, many more options and styles have been brought to the marketplace. So lets take a look at the types, features, and lingo to gain a better understanding of the cam and groove product line. Cam and groove couplings are interchangeable to standard A-A-59326D for all sizes between 3/4 inch and 6 inch – The size being the cam interchange. This means that couplings of varying brands will connect to one another in any size meeting this standard. Couplings beyond 6 inch or below 3/4 inch may not interchange unless the set is produced by the same manufacturer. The basic 8 are the most commonly stocked and requested cam couplings. These include hose shank, male thread, or female thread, and blank end covers, in cam (female) and groove (male). But wait, this chart actually shows 9 types. The bottom row, center photo shows the male X female reducer, the most common in the lineup of reducing adapters. 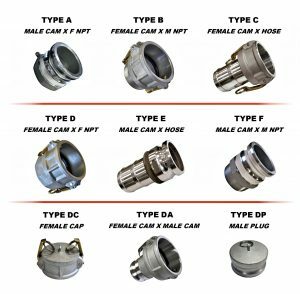 The types shown above, (plus additional reducers, flange adapters, elbows) offered in a number of sizes and materials make for a dizzying amount of cam lock coupling types. 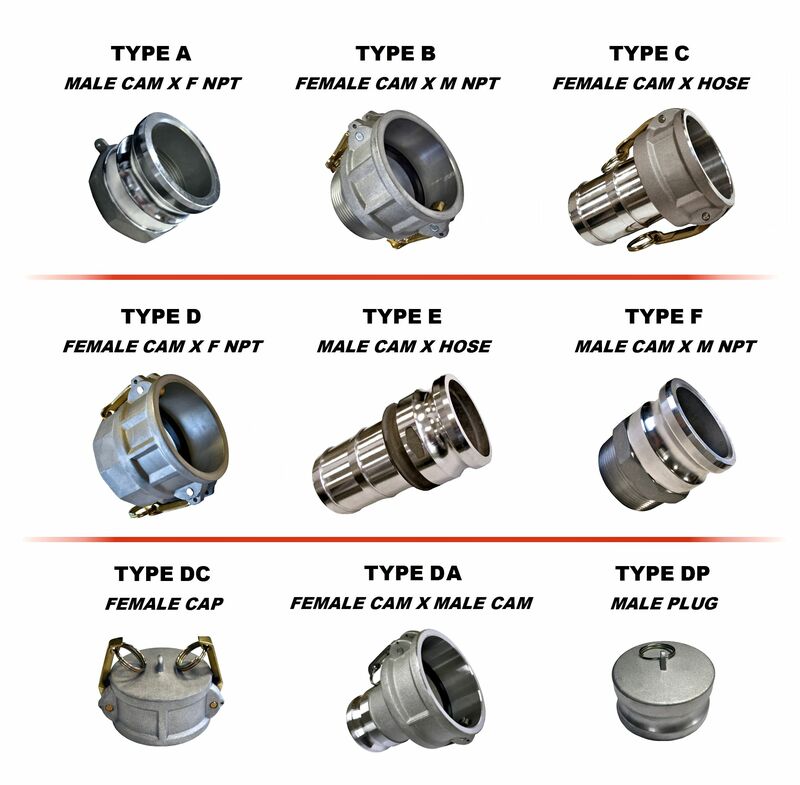 But lets focus now on a review of the different styles of cam lock couplings on the market today. 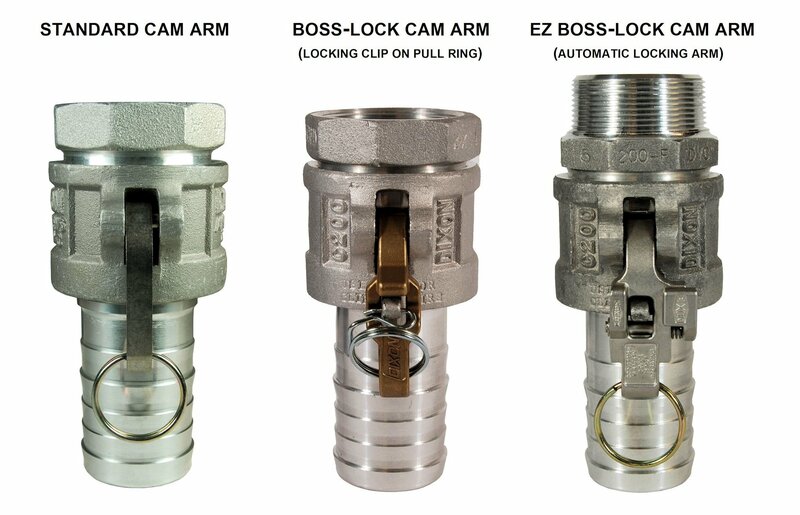 Even though commonly known as ‘cam lock’ couplings, many standard cam arms have no lock or latching mechanism. This means that they can be lifted into the open position by dragging, handling, or vibration. Some standard fittings now include safety clips, with a matched pin hole drilled through the coupling. This blocks the cam arm from opening but only if the pin is used. Since these pins go missing or unused, manufacturers innovated to make these hose couplings safer. Because of this issue, premium couplings were developed with safety pins permanently connected to (or incorporated into) the cam arm. The Boss-Lock Coupling™ from Dixon Valve & Coupling incorporates the pin into the pull ring (See center coupling in photo). 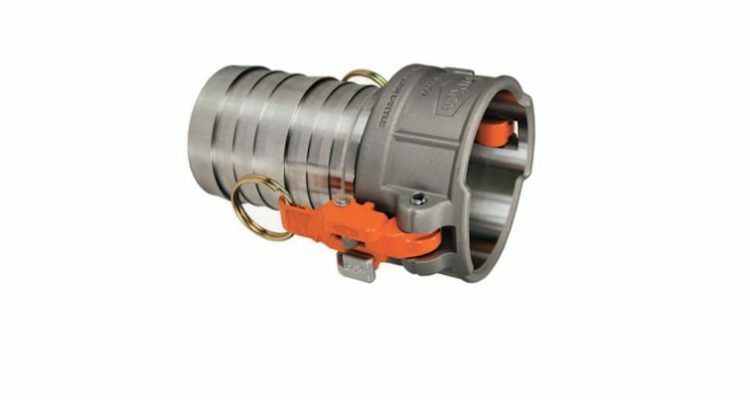 The Sta-Lok® Coupling from PT Coupling includes lanyards that secure the clip to the ring. But this preventative measure only works if the operator utilizes the safety clip. To take away the option of not using the clip and make it mandatory, an automatically locking coupling was developed. The EZ Boss-Lock™ Coupling from Dixon Valve & Coupling, and the Sta-Lok® II Coupling from PT Coupling, feature cam arms that lock into place as the cam arm is closed. To release, a spring loaded latch must be depressed which unlocks the cam arm. OPW Autolok® Ever-Tite and Cobra brand cam lock couplings also offer an automatic locking cam arm. Some applications have a higher risk from hose blows back if the couplings become separated under pressure. To reduce the risk of injury and contain hazardous spills, Vent-Lock™ safety venting cam and groove couplings were developed. These couplings have a groove in the male adapter that must be aligned with a notch on the interior of the cam arm. The coupling half is then turned 90 degrees, thereby locking the cam coupling and adapter in place. To disconnect, the cam arm notches and groove on the adapter must be again aligned, allowing the male adapter to pass through. To make mating the notch and groove more user friendly, a swivel is incorporated into the female cam coupling. Because the notched coupling and adapter must be aligned, this style will not mate with other brands or standard cam lock couplings. It can be difficult to close the cam arms when connecting heavy large-diameter hoses while supporting their weight. The latest advancement in cam and groove targets this difficulty by eliminating the cam arm completely. New EZLink™ cam and groove couplings from Dixon Valve and Coupling feature spring-loaded tabs instead of cam arms. These tabs offer an innovative push to connect closure. Press the adapter into the coupler and listen for an audible click as each tab locks into place. This design eliminates the risk of a cam arm opening due to vibration, or a cam arm breaking off during transport or storage. Additionally, the tabs carry a limited lifetime warranty.